MailPoet is a company with a small team. To support and develop this entirely free plugin, we need to pay their salaries. 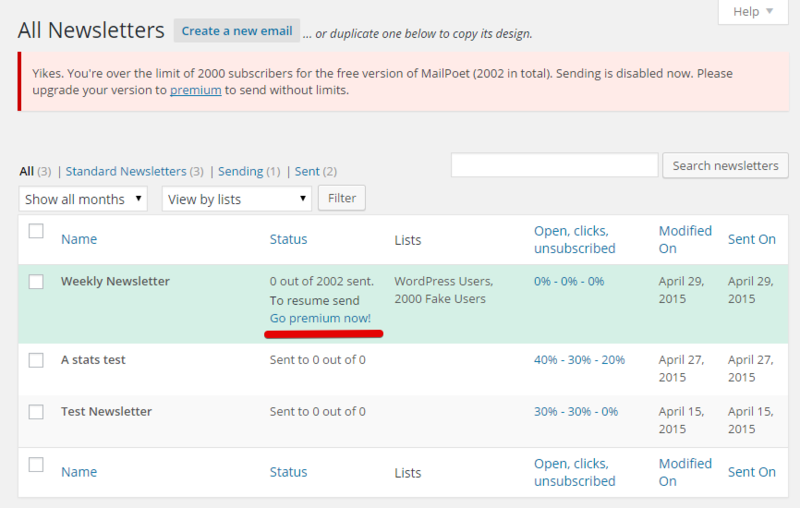 Yes, that's right, MailPoet is a free plugin! If you go to this page and read the differences between the Free and the Premium licenses, you will notice that the Free plugin has essentially all of the same basic features. We needed to find a way to keep the lights on, which is why we created the 2000 subscriber limit. How do you calculate 2000 subscribers? Please note: even if you are over the 2000 limit, visitors to your site can still sign up for your newsletters. You can also continue to import additional subscribers. What happens if I go over the 2000 subscriber limit? Is there a limit to the number of Newsletters that I can send? There is no limitation on the numbers of emails sent. For example, you can have less than 2000 subscribers but send 10000 emails to those subscribers, every day. What about a Multisite install? The 2000 limit only applies to individual websites, not the entire network of sites. How to activate my Premium license?